Tis’ the season for spruce in Rochester. The holidays are winding down and all around southeastern Minnesota people are admiring the evergreens in their landscape with a fresh coating of snow. Spruce, fir and pine get a lot of attention around the holiday season because of their pleasant scent, lush green appearance, and distinctive shape. Though their popularity peaks in the winter months, these trees are an attractive addition to Midwestern lawns all year round. That is, of course, if they’re healthy! Maier Tree and Lawn has been educating clients regarding the fungal disease Rhizosphaera needle cast on Colorado blue spruce due to its destructive nature and prevalence in Minnesota. Another fungal disease, Lirula needle blight, is becoming more and more common on white spruce and the sub-species Black Hills spruce. If you’re a spruce owner in the Midwest, here is what you need to know to keep your spruces in tip top condition! If you’re trying to spot Rhizosphaera needle cast in your Colorado blue spruce, you’ll first have to consider the time of year. The appearance of the disease changes depending upon what stage the disease itself is in as well as the season. In the summer, look for yellowing needles or odd, patchy areas that weren’t there before. If you’re taking a look now, during the winter months, keep your eyes peeled for purplish needles or brown areas. Those of you with incredibly good eyes (or a magnifying glass) should also watch for black dots along needles that appear to be infected. This is a sign of fungus! Lirula needle blight in white spruce and Black Hills spruce behaves similarly. Infected needles that are two or three years old will become discolored purplish-brown. 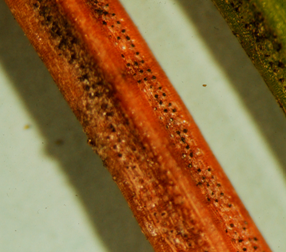 With a magnifying glass you may see rows of black spots, particularly on the underside of the needles. Infected needles may persist on the tree for a year or two. For both needle diseases, fungal spores spread to new needles as they expand through rain splash in early summer. This is why evidence of the disease is most common in the lower portion of the tree. Once you spot signs of Rhizosphaera needle cast or Lirula needle blight, take action! Leaving your tree alone with the fungus won’t just cause color changes among the needles. Long term consequences include losing all of the needles along the bottom of the tree, branch death, and potentially the death of the entire tree. Unlike some tree diseases, Rhizosphaera and Lirula aren’t necessarily a death sentence. Without treatment the tree may survive, but it will likely look several steps beyond scruffy. If you’re looking to prevent the fungus from forming in the first place it can be helpful to plant your trees apart from each other to give them breathing room. It also helps to avoid over-watering or any type of shearing. However, if it’s too late for this early tree care, chemical steps can be taken as well. Fungicide treatments can be very effective at controlling both diseases and helping your trees return to good health. The trees will need to be treated two or three times a year at the proper timing, and you should expect to repeat the treatment for at least 3 years running. If you are interested in applying fungicides or any other type of chemical to your spruces to help their recovery, make sure you do so only after consulting tree care professionals. Without the proper equipment and tools, spraying or treating your trees can do more harm than good. With proper treatment your spruce can recover and continue to brighten your lawn! Residents of southeastern Minnesota can contact the tree care specialists at Maier Tree and Lawn with any questions about Rhizosphaera needle cast and Lirula needle blight or for more information regarding a spruce treatment plan and fungicide options. Give us a call at 507.286.8733 or contact us through our website here!